The Non-Commercial Users Constituency (NCUC) is the home for civil society organisations, public interest groups, and individuals in ICANN’s Generic Names Supporting Organization (GNSO). It is the most diverse body in the GNSO, with over 500 members in over 100 countries. The NCUC amplifies the voice of individuals and civil society organizations in the development of the Domain Name System and this area of the Internet’s infrastructure. The NCUC has significant voting power in ICANN’s policy-making processes and its members work diligently to develop and support positions that favour non-commercial communication and activity online. Among other issues, the NCUC has been instrumental in developing an awareness within the ICANN community as to why the fundamental right to privacy is one which must be protected. 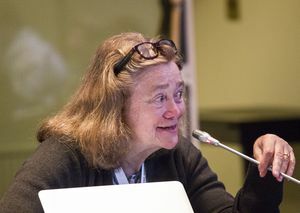 Stephanie Perrin, an accomplished civil servant, winner of the EFF Pioneer Award, and active NCUC member, speaks on privacy matters at an ICANN meeting. The NCUC is constituted in the ICANN Bylaws as a member of the Non-Commercial Stakeholder Group (NCSG). Its main objective is to represent the interests and positions of individuals and the civil society involved in non-commercial Internet activities such as education, promotion of arts, religion, children's welfare, scientific research, and others using internet as a global communication method. The NCUC has a proud history that stretches back almost 20 years. It has taken principled and consistent stances in support of Internet freedoms and human rights. This non-commercial outlook has heavily influenced policy matters within ICANN today. The NCUC was established in 1999 as the original voice of non-commercial interests within ICANN. Following a major restructuring of the GNSO in 2008, it was possible for the number of constituencies to constantly be in flux, while providing a constant voice through the Stakeholder Groups. Thus, the NCUC was the predecessor of the NCSG, which it is now a part of it. 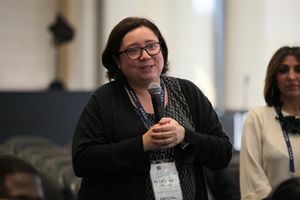 Dr Renata Aquino Ribeiro, Chair of the NCUC, introduces the NCUC to newcomers to the ICANN community. The NCUC strives to create a welcoming environment for new members. Mobilize civil society actors to participate in ICANN. Elect representatives to the GNSO Council, which coordinates the policy development process for generic Top Level Domains. Collaborate and interact with other stakeholders in ICANN on matters of common concern, including businesses, governments, and others. Develop and advocate policy positions. Send members around the world to engage and participate in important agenda setting and decision making processes. Organize conferences and events exploring global Internet governance issues. Executive Committee is responsible for administering the different activities of the Constituency, it is headed by a chairman who is elected yearly. It also consist of a Vice-Chair, Secretary-Treasurer and one representative from every geographical region. Rafik Dammak, former Chair of the NCUC, and now representing the NCUC as Vice Chair of the GNSO Council, crafts policy with an NCUC member. 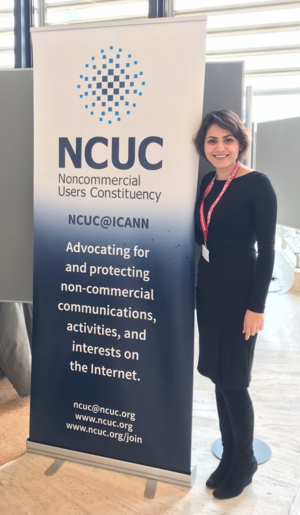 Farzaneh Badii, former Chair of the NCUC, conducts outreach activities at the United Nations Internet Governance Forum in Geneva in December 2017 to grow the NCUC's membership. The NCUC places great priority on developing the skills of its members. In 2018, a policy writing course will be held in San Juan, Puerto Rico to improve members abilities to respond to opportunities for public comment. This is being funded through a $20,000 special budgetary request. In 2017, a two-day outreach event was held as a pre-event to ICANN 59 in Johannesburg, South Africa, where local civil society practitioners were invited to discover how their work relates to the activities of the NCUC. This event was a resounding success, organised in a bottom-up manner by the NCUC membership with a mere $7,500 from ICANN to cover to venue hire, and received praise from the local participants and the ICANN CEO. 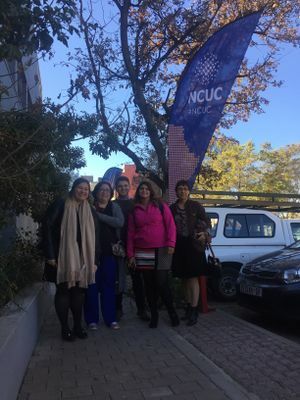 A diverse group of NCUC members facilitated the two-day Johannesburg outreach pre-event, which introduced local civil society practitioners to the DNS policy space. The Noncommercial Users Constituency is composed of different groups such as the GNSO Operations Team, Interest-Group-Formation: Librarians, Scientific, Technical, and Academic Experts, Post-Expiration Domain Name Drafting Team, Fundraising Committee, Operations Steering Committee, Consumer Rights, and many other groups. Dr Milton Mueller, a founding NCUC member and influential scholar, speaks on policy matters at ICANN 54 in Dublin. The NCUC, like any other Constituency, is active in sharing its comments and recommendations to different ICANN Policy Issues. On June 12th, 2007, NCUC submitted its statement regarding the GNSO New TLD Committee’s Draft Final Report On The Introduction of New Generic Top Level Domains and opined that the draft report consists of flaws and it is a "recipe for irregularity, discretion and uncertainty in the new domain name space". 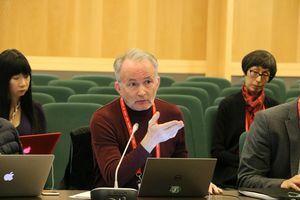 The Constituency argued that the introduction of morally acceptable and not contrary to public order as a string criteria is troubling and expressed its strong opposition to this proposal and pointed that it is beyond ICANN's technical mandate. NCUC also rejects the expansion of the role of ICANN Staff and outside expert panels in evaluating the criteria that are non technical, financial or operational. The Constituency recommended that the role of ICANN Staff should be limited only to identifying if a domain name applicant met the operational, technical, and financial requirements objectively and should not evaluate on the basis of morality or other public policy objectives. Furthermore, NCUC also opposed the "substantial opposition" criteria for rejecting a domain name because it is a bad policy for the public and for ICANN. The Constituency argued that the substantial opposition criteria is incompatible with the internationally recognized Freedom of Expression guarantees. On April 1, 2010, NCUC also commented regarding the Uniform Rapid Suspension (URS) System and the Trademark Clearinghouse Proposals that were revised by ICANN Staff. The Constituency cited that both documents represent the main deliberations and conclusions of GNSO's Special Trademark Issues Team, however, the Constituency found that some specific issues doesn't substantially coincide with the GNSO-STI recommendations. It also noticed that although ICANN Staff tried to consolidate the opinions of the Internet community regarding the issues but they believed that staff comments were added to the policy and pointed that it is arbitrary, unjustifiable and illegal. There was a general disapproval of closed door meetings convened in November, 2012, by new ICANN CEO, Fadi Chehadé, at the bequest of ICANN's Intellectual Property Constituency and Business Constituency, and Ms. Maria Farrell of the NCUC was the first to submit an official complaint to the ICANN Ombudsman. In a public post she went on the explain, "The complaint is not simply about lack of consultation of constituencies, but about secrecy of the process re. notice, transcripts and documentation, and how it undermines the existing processes whilst privileging a particular interest group." The complaint was brought up by the Ombudsman who asked for further input. However, ICANN CEO Fadi Chehadé admitted some 2 months later that convening the meetings and producing the Strawman Solution to the Trademark Clearinghouse was the biggest mistake of his first months as CEO. This page was last edited on 27 June 2018, at 14:22.